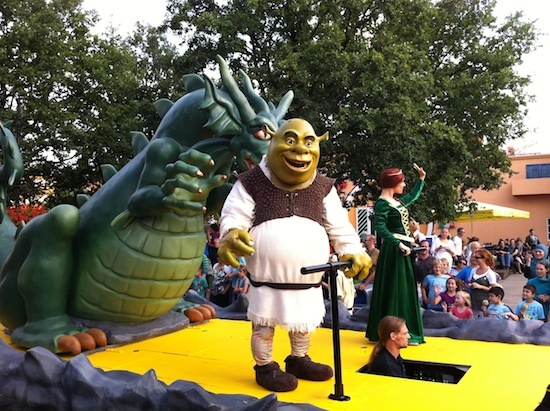 The team of IMAscore produced the parade-music with German and English lyrics, which accompanies SpongeBob, Shrek, Van Helsing and all the other characters on their way through the park during the parade. The different language-versions of the musical’esque orchestra music rotate, so visitors from foreign countries feel adressed. The song is sung by Dirk Stollberg, who already sung and inspired his audience with his voice in musicals (Stage Entertainment’s „The Beauty and the Beast“, „Mamma Mia“, a.o. ), movies („Horton hears a Hu!“) and series („Scrubs“, „Prison Beark“ and many more). The enthusiasm we saw, first of all in the eyes of the younger visitors during our stays and the great commendation by the park’s administration were overwhelming – we already saw the first people sing along!